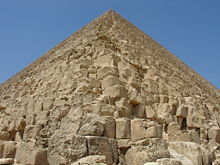 The Great Pyramid is the oldest and the largest of the three pyramids in the Giza Necropolis bordering what is now Cairo, Egypt in Africa. The only remaining member of the ancient Seven Wonders of the World, it is believed to have been constructed over a 20-year period concluding around 2560 B.C.E. as a tomb for the Fourth dynasty Egyptian pharaoh Khufu (Cheops). It is sometimes called Khufu's Pyramid or the Pyramid of Khufu. The enormity of the Great Pyramid poses a challenge for any who would attempt to explain how it could have been constructed. It is estimated to comprise some 2.4 million stone blocks averaging 2.5 tons (2.27 metric tons) each, plus additional blocks weighing considerably more lying deep within the pyramid where they serve special functions. Its height when new, 480.9 feet (146 m), would have been within 74 feet (21.3 m) of the top, 555 feet (169.7 m), of the Washington Monument in Washington, DC, which was built 4,444 years later. The average weight of the blocks used in the pyramid and the monument is roughly the same, but the Great Pyramid comprises roughly 65 times as many blocks as the Washington Monument. Building the Great Pyramid in 20 years—the commonly accepted time frame—would have required placing 1.1 blocks in their final resting place every two minutes, over a work schedule of 365 days a year, if the block-laying were continuous for 10 hours per day. Additional imponderables are the time and effort involved in quarrying that many stones and transporting them to the site, some from a quarry 8 miles (12.8 km) away across the river and others from a quarry more than five hundred miles (800 km) away; preparing the 13-acre site (5.2 hectares) to host the pyramid would have been its own major feat, and all would have needed to be carefully coordinated. A number of alternative theories have been proposed to explain how the Great Pyramid was built. The Great Pyramid is the main part of a complex setting of buildings that included two mortuary temples in honor of Khufu (one close to the pyramid and one near the Nile), three smaller pyramids for Khufu's wives, an even smaller "satellite" pyramid, a raised causeway connecting the two temples, and small mastaba tombs surrounding the pyramid for nobles. One of the small pyramids (discovered in 1925) contains the tomb of Queen Hetepheres, sister and wife of Sneferu and the mother of Khufu. There was a town for the workers of Giza, including a cemetery, bakeries, a beer factory, and a copper-smelting complex. More buildings and complexes are being discovered by The Giza Mapping Project. Several hundred feet southwest of the Great Pyramid lies the slightly smaller Pyramid of Khafre, one of Khufu's successors who is also commonly considered the builder of the Great Sphinx, and several hundred feet further southwest is the Pyramid of Menkaure, Khafre's successor, which is about half as tall. The estimated completion date of the Great Pyramid is around 2560 B.C.E. 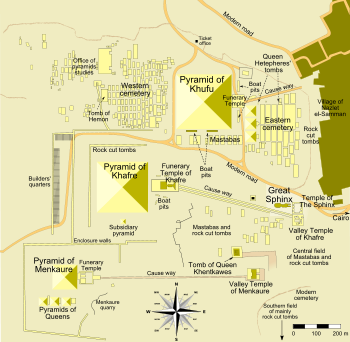 Khufu's vizier, Hemon, is credited as its architect. Written accounts of Egyptian engineering methods are scarce, and thus debate about how they built the Great Pyramid has continued for centuries. Many alternative, often contradictory, theories have been proposed regarding the pyramid's construction techniques. There is disagreement on whether the blocks were dragged, lifted, or even rolled into place. There are also many questions concerning the methods by which they were placed in position. The pyramid was constructed of cut and dressed blocks of limestone, basalt, or granite. The core was made mainly of rough blocks of low-quality limestone taken from a quarry at the south of Khufu’s Great Pyramid. These blocks weighed from two to four tons on average, with the heaviest used at the base of the pyramid. An estimated 2.4 million blocks were used in the construction. High quality limestone was used for the outer casing, with some of the blocks weighing up to 15 tons. This limestone came from Tura, about eight miles away on the other side of the Nile River. Granite, quarried nearly five hundred miles away in Aswan with blocks weighing as much as 60 to 80 tons (54 - 72 metric tons), was used for the king's chamber and receiving chambers. The total mass of the pyramid is estimated at 5.9 million tons (5.3 million metric tons) with a volume (including an internal hillock) believed to be 3,400,672 cubic yards (2.6 million cubic m). 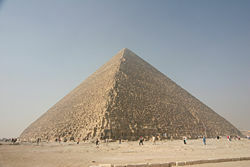 The pyramid is the largest in Egypt and the tallest in the world. It is surpassed in volume only by the Great Pyramid of Cholula in Puebla, Mexico, which, however, is much lower in height than Khufu's Pyramid. At completion, the Great Pyramid was surfaced by white casing stones—slant-faced, but flat-topped, blocks of highly polished white limestone. These caused the monument to shine brightly in the sun, making it visible from a considerable distance. What can be seen today of the structure from afar is only the underlying step-pyramid core structure, but several of the casing stones can still be found around the base. The casing stones of the Great Pyramid and Khafre's Pyramid (constructed directly beside it) were cut to such optical precision as to be off true plane over their entire surface area by only one-fiftieth of an inch. They were fitted together so perfectly that the tip of a knife cannot be inserted between the joints even to this day. In the fourteenth century (1301 C.E. ), a massive earthquake loosened many of the outer casing stones, which were then carted away by Bahri Sultan An-Nasir Nasir-ad-Din al-Hasan in 1356 in order to build mosques and fortresses in nearby Cairo; the stones can still be seen as parts of these structures to this day. Later, explorers reported massive piles of rubble at the base of the pyramids left over from the continuing collapse of the casing stones which were subsequently cleared away during continuing excavations of the site. Nevertheless, many of the casing stones around the base of the Great Pyramid can be seen to this day in situ, displaying the same workmanship and precision as has been reported for centuries. Many varied estimates have been made regarding the workforce needed to construct the Great Pyramid. Herodotus, the Greek historian in the fifth century B.C.E., estimated that construction may have required 100,000 workers for 20 years. Recent evidence has been found that suggests the workforce was paid, which would require accounting and bureaucratic skills of a high order. Polish architect Wieslaw Kozinski estimated that it would have taken as many as 20 men to transport a 1.5-ton (1.36 metric tons) stone block. Based on this, he numbered the workforce at 300,000 men on the construction site, with an additional 60,000 off-site. 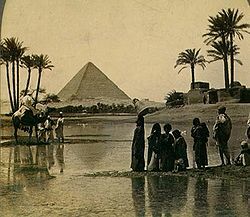 Nineteenth-century Egyptologist William Flinders Petrie proposed that the workforce was largely composed not of slaves, but of the rural Egyptian population, working during periods when the Nile River was flooded and agricultural activity was suspended. Egyptologist Miroslav Verner posited that the labor was organized into a hierarchy, consisting of two gangs of 100,000 men, divided into zaa or phyle of two hundred men each, which may have been further divided according to the skills of the workers. Some research suggests alternate estimates to the accepted workforce size. For instance, mathematician Kurt Mendelssohn calculated that the workforce may have been 50,000 men at most, while Ludwig Borchardt and Louis Croon placed the number at 36,000. According to Verner, a workforce of no more than 30,000 would have been needed in the Great Pyramid's construction. A construction-management study (testing) carried out by the firm Daniel, Mann, Johnson, & Mendenhall in association with Mark Lehner and other Egyptologists, estimated that the total project required an average workforce of 14,567 people and a peak workforce of 40,000. Without the use of pulleys, wheels, or iron tools, they surmise the Great Pyramid was completed from start to finish in approximately ten years. 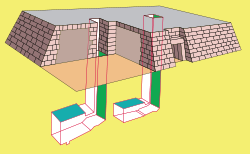 Their critical path analysis study estimates that the number of blocks used in construction was between two to 2.8 million (an average of 2.4 million), but settles on a reduced finished total of two million after subtracting the estimated area of the hollow spaces of the chambers and galleries. The Egyptologists' calculations in that study suggest the workforce could have sustained a rate of 180 blocks per hour (three stones per minute) with ten-hour work days for putting each individual block in place. They derived these estimates from construction projects that did not use modern machinery. Papyrus documents and existing, cubit-measuring rods give us the units of measure used to specify the plan of the pyramid and so it is thought that, at construction, the Great Pyramid was 280 Egyptian royal cubits tall (480.9 feet (146 m)), but with erosion and the theft of its topmost stone (the pyramidion) its current height is 455.2 feet (138.7 m). Today each side of the pyramid has an approximate length of about 755.8 feet (230.5 m), with the base covering 63,388 square yards (53,000 square m). The slope angle of the sides of the pyramid is 51.50.40 degrees. The reduction in size and area of the structure into its current, rough-hewn appearance is due to the absence of its original polished casing stones, some of which measured up to 8.2 feet (2.5 m) thick and weighed more than 15 tons (13.600 metric tons). 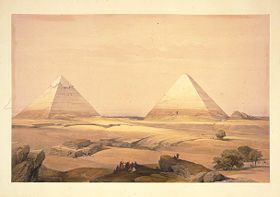 The first precision measurements of the pyramid were done by Sir Flinders Petrie from 1880 to 1882, and published as "The Pyramids and Temples of Gizeh." Almost all reports are based on his measurements. The ratio of the perimeter to height of 1760/280 cubits equates to 2π to an accuracy of better than 0.05% (corresponding to the well-known approximation of π as 22/7). Petrie concluded: "but these relations of areas and of circular ratio are so systematic that we should grant that they were in the builder's design". Some have argued that the Ancient Egyptians had no concept of pi and would not have thought to encode it in their monuments. They suggest alternative explanations such as the observed pyramid slope may be based on a simple seked slope choice alone, with no regard to the overall size and proportions of the finished building. Nevertheless, many Egyptologists acknowledge that "although the ancient Egyptians could not precisely define the value of π, in practice they used it." Petrie found the pyramid is oriented four minutes West of North and the second pyramid is similarly oriented. He also found a different orientation in the core and in the casing. Petrie suggested a redetermination of north was made after the construction of the core, but a mistake was made, and the casing was built with a different orientation. This deviation from the north in the core, corresponding to the position of the stars Ursae Minoris and Ursae Majoris about three thousand years ago, takes into account the precession of the axis of the Earth. A study by Egyptologist Kate Spence shows how the changes in orientation of eight pyramids corresponds with changes of position of those stars through time. This would date the start of the construction of the pyramid at 2467 B.C.E. For four millennia the Great Pyramid was the world's tallest building, unsurpassed until the 525-foot(160 m)-tall spire of Lincoln Cathedral was completed around 1300 C.E. The passages inside the pyramid are all extremely straight and precise, such that the longest of them, referred to as the descending passage, which is 350 feet (107 m) long deviates from being truly straight by less than 0.25 inches (6mm), while one of the shorter passages with a length of just over 150 feet (45.7 m) deviates from being truly straight by a mere 0.020 inches (.5mm). The Great Pyramid differs in its internal arrangement from the other pyramids in the area. The greater number of passages and chambers, the high finish of parts of the work, and the accuracy of construction all distinguish it. The walls throughout the pyramid are totally bare and uninscribed, but there are inscriptions—to be more precise, graffiti—believed to have been made by the workers on the stones before they were assembled. The most famous inscription is one of the few that mentions the name of Khufu; it says "year 17 of Khufu's reign." There are three known chambers inside the Great Pyramid. These are arranged centrally, on the vertical axis of the pyramid. The lowest chamber (the "unfinished chamber") is cut into the bedrock upon which the pyramid was built. This chamber is the largest of the three, but totally unfinished, only rough-cut into the rock. The middle chamber, or queen's chamber, is the smallest, measuring approximately 18.83 feet (5.74 m) by 17.16 feet (5.23 m), and 14.99 feet (4.57 m) in height. Its eastern wall has a large angular doorway or niche, and two narrow shafts, about two-thirds of a foot wide, extending from the chamber towards the outer surface of the pyramid. These shafts were explored using a robot, Upuaut 2, created by Rudolf Gantenbrink. These shafts were blocked by limestone "doors" with eroded copper "handles." During the drilling of a small hole in the southern door, another larger door behind it was found. The northern passage (which was harder to navigate due to twists and turns) was also found to have a door. Egyptologist Mark Lehner believes that the queen's chamber was intended as a serdab—a structure found in several other Egyptian pyramids—and that the niche would have contained a statue of the interred. The ancient Egyptians believed that the statue would serve as a "back up" vessel for the Ka of the Pharaoh, should the original mummified body be destroyed. The true purpose of the chamber, however, remains a mystery. At the end of the lengthy series of entrance ways leading into the pyramid interior is the structure's main chamber, the King's Chamber. This chamber was originally about 17 x 34 x 19 feet (5.2 x 10.4 x 5.8 m), comprising a double 10-by-10 cubit square (10 cubits = 17 feet), and a height equal to half the double square's diagonal (22.36 cubits = 38 feet). The other main features of the Great Pyramid consist of the Grand Gallery, the sarcophagus found in the king's chamber, both ascending and descending passages, and the lowest part of the structure mentioned above, what is dubbed the "unfinished chamber." The Grand Gallery (160.8 x 9.8 x 36.01 feet) (49 x 3 x 11 m) features an ingenious, corbel-halloed design and several cut "sockets" spaced at regular intervals along the length of each side of its raised base with a "trench" running along its center length at floor level. What purpose these sockets served is unknown. The Red Pyramid of Dashur also exhibits grand galleries of similar design. The sarcophagus of the king's chamber was hollowed out of a single piece of Red Aswan granite and has been found to be too large to fit through the passageway leading to the king's chamber. Whether the sarcophagus was ever intended to house a body is unknown, but it is too short to accommodate a medium height individual without the bending of the knees (a technique not practiced in Egyptian burial) and no lid was ever found. The "unfinished chamber" lies 90 feet (27.5 m) below ground level and is rough-hewn, lacking the precision of the other chambers. This chamber is dismissed by Egyptologists as being nothing more than a simple change in plans in that it was intended to be the original burial chamber but later King Khufu changed his mind wanting it to be higher up in the pyramid. Considering the extreme precision and planning given to every other phase of the Great Pyramid's construction, this conclusion seems surprising. Two French amateur Egyptologists, Gilles Dormion and Jean-Yves Verd'hurt, claimed in August 2004 that they had discovered a previously unknown chamber inside the pyramid underneath the queen's chamber using ground-penetrating radar and architectural analysis. They believe the chamber to be unviolated and could contain the king's remains. They believe the king's chamber, the chamber generally assumed to be Khufu's original resting place, was not constructed to be a burial chamber. Traditionally, the evidence for dating the Great Pyramid has been based primarily on fragmented summaries of early Christian writings gleaned from the work of the Hellenistic Period Egyptian priest Manetho, who compiled the now-lost revisionist Egyptian history Aegyptika. These works, together with earlier Egyptian sources such as the "Turin Canon" and "Table of Abydos," combine to form the main body of historical reference for Egyptologists giving a timeline of rulers known as the "King's List." Egyptologists have ascribed the pyramid to Khufu, establishing the time he reigned by default subsequently dates the monument as well as the confines for its completion of construction. The Edgar Cayce Foundation, researching claims that the pyramids were at least 10,000 years old, funded the "David H. Koch Pyramids Radiocarbon Project" in 1984. The project took samples of organic material (such as ash and charcoal deposits) from several locations within the Great Pyramid, and other pyramids and monuments from the Old Kingdom period (c. third millennium B.C.E.). These samples were subjected to radiocarbon dating to produce calibrated date-equivalent estimates of their age. This yielded results averaging 374 years earlier than the estimated historical date accepted by Egyptologists (2589–2504 B.C.E.) but still far more recent than 10,000 years ago. A second dating in 1995 with new but similar material obtained dates ranging between one hundred to four hundred years earlier than those indicated by the historic record. This raised questions concerning the origin and date of the wood. Massive quantities of wood were used and burned, so to reconcile the earlier dates the authors of the study theorized that possibly "old wood" was used, assuming that wood was harvested from any source available, including old construction material from all over Egypt. It is also known, given the poor quality and relative scarcity of native Egyptian woods, that King Sneferu (and later Egyptian pharaohs) imported fine woods from Lebanon and other countries such as Nubia for the creation of decorative furniture, royal boats (as found buried around the Giza Plateau), or other luxuries generally reserved for royalty furniture. But as Mark Lehner points out, such efforts were not without "great cost." It is unknown, given the expense, effort, and value of such woods, if they were ever imported as an expendable source of industrial fuel, especially on such a large scale. Project scientists based their conclusions on the evidence that some of the material in the Third Dynasty pyramid of Pharaoh Djoser and other monuments had been recycled, concluding that the construction of the pyramids marked a major depletion of Egypt's exploitable wood. Dating of more short-lived material around the pyramid (cloth, small fires, etc.) yielded dates nearer to those indicated by historical records. As of yet the full data of the study has yet to be released in which the authors insist more evidence is needed to settle this issue. In the absence of the "old wood" theory, the study admits "The 1984 results left us with too little data to conclude that the historical chronology of the Old Kingdom was in error by nearly 400 years, but we considered this at least a possibility." In common with many other monumental structures from antiquity, the Great Pyramid has over time been the subject of a great number of speculative or alternative theories, which put forward a variety of explanations about its origins, dating, construction, and purpose. In support of these claims such accounts either rely upon novel reinterpretations of the available data from fields such as archaeology, history, and astronomy, or appeal to biblical, mythological, mystical, numerological, astrological, and other esoteric sources of knowledge, or some combination of these. Such ideas have been part of popular culture since at least the turn of the twentieth century and can be traced back among others to such figures as the early-twentieth-century American psychic Edgar Cayce, whose "psychic channeling" of Ra Ta purports to have conveyed that the pyramids were built by refugees from Atlantis, and even to his predecessor Ignatius L. Donnelly. In recent years, some of the more widely publicized writers of alternative theories include Graham Hancock, Robert Bauval, John Anthony West, and Boston University geology professor Robert M. Schoch. These have written extensive alternative theories about the age and origin of the Giza pyramids and the Sphinx. While many Egyptologists and field scientists tend to dismiss such accounts out of hand as being a form of pseudoarchaeology, other specialists such as astronomy professor Ed Krupp who have been involved in the debate have put forward astronomical refutations based on the presented evidence for several of their claims. The proponents have in their turn presented their counter-rebuttals. A theme found in some of the alternative theories put forward concerning the Giza pyramids and many other megalithic sites around the world, is the suggestion that these are not the products of the civilizations and cultures known to conventional history, but are instead the much older remnants of some hitherto unknown, advanced ancient culture. This progenitor civilization is supposed to have been destroyed in antiquity by some devastating catastrophe brought about by the end of the last ice age, according to most of these accounts sometime around 10,000 B.C.E. For the Great Pyramid of Giza, in particular, it is maintained (depending on the theorist) that either it was ordained and built by this now-vanished civilization, or else that its construction was somehow influenced by knowledge (now lost) acquired from this civilization. The latter point of view is more common among recent theorists such as Hancock and Bauval, who believe that the Great Pyramid incorporates star shafts 'locked in' to Orion's Belt and Sirius at around 2450 B.C.E., though they argue the Giza ground-plan was laid out in 10,450 B.C.E. The a priori existence of such a civilization is postulated by such theorists who believe this is the only reasonable explanation for how the most advanced of ancient cultures, such as Egypt and Sumer, were able to reach such high levels of unequaled technological advancement with what they claim is little or no precedent. This precedent they argue exists in the form of megalithic ruins found all over the globe discovered at the beginnings of history, but too complex, they argue, to have been constructed by the cultures they are ascribed to by the mainstream. As another of these theorists John Anthony West writes in reference to Egypt, in particular: "How does a complex civilization spring full blown into being? Look at a 1905 automobile and compare it to a modern one. There is no mistaking the process of 'development'. But in Egypt there are no parallels. Everything is right there from the start." ↑ Ian Shaw, Building the Great Pyramid BBC History. Retrieved June 25, 2014. ↑ Richard Noone. Ice: The Ultimate Disaster (New York: Three Rivers Press, 1988. ISBN 0517561425), 104-105. ↑ Sir William Matthew Flinders Petrie, The Pyramids and Temples of Gizeh (Kessinger Publishing, LLC, 2007, ISBN 978-1432528263). ↑ Corinna Rossi, Architecture and Mathematics in Ancient Egypt (Cambridge University Press, 2007, ISBN 978-0521690539). ↑ Miroslav Verner, The Pyramids: Their Archaeology and History (Atlantic Books, 2003, ISBN 978-1843541714). ↑ Hazel Muir, “Pyramid precision.” New Scientist (November 15, 2000). Retrieved May 24, 2007. ↑ Alan Winston, The Pyramid of Khufu at Giza in Egypt. touregypt.net. Retrieved May 23, 2007. ↑ David H. Koch, "Dating the Pyramids." Archaeology (September/October 1999). ↑ Graham Hancock, “Like a Thief in the Night.” Fingerprints of the Gods, chap. 52. The Official Graham Hancock Website. Retrieved June 14, 2007. ↑ John Anthony West, Serpent in the Sky: The High Wisdom of Ancient Egypt SourceText.com. Retrieved June 23, 2015. Koch, David H. "Dating the Pyramids." Archaeology (September/October 1999). The Upuaut Project by Rudolf Gantenbrink. 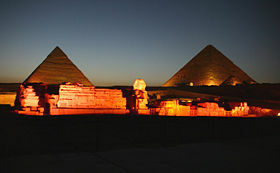 Pyramids - Guardian's Egypt by Andrew Bayuk. The Great Pyramid and Transport of Heavy Stone Blocks by Henk J. Koens. History of "Great Pyramid of Giza"
This page was last modified on 13 July 2017, at 16:41.